Vinod Kambli was once regarded as a very talented batsman and he proved it by hitting two back to back double centuries in Test cricket. But he has not a long cricket career due to his lost in form and behaviour. To know more about this former Indian cricketer, read the below given article. Vinod Kambli is a former Indian cricketer who has represented India in both Test and ODIs. Kambli was regarded as a very talented batsman, but this left-hand batsman failed to live up to his expectations. Still he is one of the few batsman from India who has batting average of more than 50. Vinod Kambli started playing cricket from very young age. He made into the news when he and Sachin Tendulkar were involved in a record partenership of 664 runs in a school match. His contribution in that partenership was 349*. 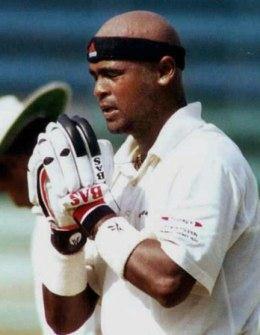 Kambli made into the National Team in 1991, playing his first ODI match against Pakistan. His Test debut came in 1993 against England at Kolkata in the 1st match of the Test series. His score in that match were 16 and 18*. In the next match at Madras, he scored 59 runs in the only innings he played. In third and last match at Mumbai, he scored 224 runs in India's first innings. India won that series against England by 3-0, and have found a very good batsman in the form of Vinod Kambli. In his next match against Zimbabwe, he made another double century by scoring 227 runs. He also won Man of the Match award for his performance in that match. In next series against Sri Lanka he scored two more centuries in three matches. His performance dropped after this and he just managed two fifties in next ten matches. He played his last test against New Zealand in 1995 when he was only 24. Vinod Kambli's ODI career spans a little longer than his test career. But he was always in and out of the team during his nine year career. He has played 104 ODIs scoring 2477 runs with an average of 32.59. He has scored two centuries and 14 half-centuries throughout his ODI career. He also played in 1996 World Cup, where in a match against Zimbabwe he scored a brilliant hundred of 106 runs in India's win. Kambli's ODI career also ends in 2000 when he wasn't picked in the Indian ODI Team. Kambli declared his retirement from International cricket in 2009.